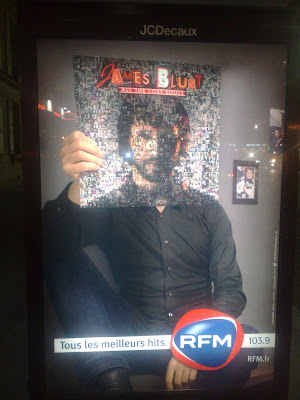 Paris radio station RFM are running outdoor ads with creative using record covers as face substitutes. I have seen two versions of the RFM creative - 1 for James Blunt and 1 for George Michael, but I'm sure there must be more. 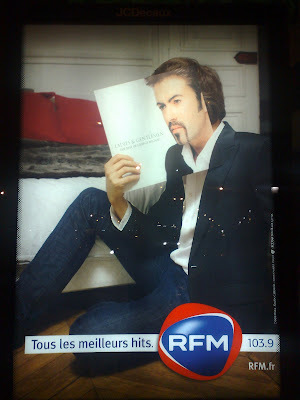 Neil Perkin has previously ranted about this style of execution here and here after seeing it used for both Smooth FM in London and fnac record stores in Spain - I'm sure he'll be pleased to add RFM to his list! Dear oh dear oh dear. Shame. The thing I object to about all of this is not so much that they nick the idea but more that they don't do anything to add to it or enhance it. Even worse that this radio station seems to have nicked the idea from another radio station. As my mum would say - is nothing sacred?